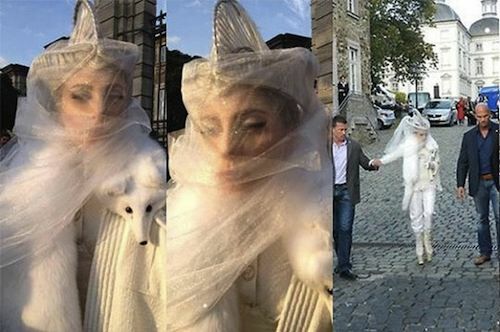 I have always respected Lady Gaga for her bold fashion statements and relatively catchy music (oh, like YOU don’t find yourself Vogue’ing when Poker Face comes on), but the hypocrisy of her latest stunt makes me wonder if there are any decent people left in Hollywood at all. The other day the singer was spotted wearing a fox fur scarf with the head of the Arctic white fox still attached, despite previously telling Ellen DeGeneres “I hate fur, and I don’t wear fur” in an earlier interview. PETA was obviously quick to jump, noting that this breed of fox is often electrocuted for its fur. This is where you would think any decent human would be like “oh yea, maybe I shouldn’t be wearing murder around my neck,” but the statement she made in a recent blog post said quite the opposite. “I have truly always stayed away from skinned fur,” she said. “But this does not mean my morals are rigid and that I won’t bend at the sight of an absolute art piece of a coat.” Oh, alright. It’s ART. That makes it OK.
See? You commoners don’t get it, calling it a “carcass” and other such vernacular. It’s a “museum piece de resistance.” How low brow of you. There was a time when I wasn’t all that phased by celebrities wearing fur, but I think at this point it’s about as tacky and senseless as saying climate change is a hoax. Maybe Lady Gaga should get attention by using the talent that made her enough money to wear animals around her neck in the first place. Does it bother you to see people still wearing fur? Do you think celebrities should be criticized for stuff like this due to the massive influence they have on our culture? I despise this woman’s lack of ethics. She’s a complete fake!